" The priority thus afforded to the vital ground (by the Germans) is in sharp contrast to the position adopted by General Haig, commander of the BEF, as recorded in his diary following a tense meeting with General Joffre during the evening of July 3d. "Joffre pointed out the importance of our getting Thievpal Hill ... I was considering the desirability of pressing my attack on Longueval ... at this General Joffre exploded in rage. 'He could not approve of it'. He 'ordered me to attack Thievpal and Pozieres ... The truth is the poor man cannot argue, nor can he easily read a map." "On the contrary, the fact of the matter is that, after two years of directing major battles against the German Army, Joffre had developed clear ideas about what was considered important by his enemies. he definitely could 'read a map', could spot a Schwerpunkt (point of main effort) when he saw one, but the command relationships meant that he did not have the power to order General Haig to do anything." The tragic part about the Schwaben redoubt is that it was captured on the first day of the Somme by British soldiers, only to be lost in a counter attack. Falkenhayn (chief of the German Great general staff) was too interested in his operations at Verdun to 'bleed the French dry' to objectively listen to General Fritz Von Below and his warnings about the French and British looming attack on the Somme. Even after the Allied attack, Falkenhayn only reluctantly released troops from the charnel house of Verdun to the Somme area. So, in many ways the Battle of The Somme fulfilled its role in taking pressure off of the French Army at Verdun. It is true that the Allied, and especially the British Army, spilled much more blood than necessary at the time. The British Army was, in 1916, a force that had to deal with a lot of growing pains. Unfortunately they had to learn many things on the job. The author shows and explains these points and more. Mr. Sheldon has, as usual, done a superb job in showing us the thoughts, actions, and reasoning behind the German defense. His chore is made that much more difficult because of the loss of most of the Prussian records from WWI in 1945. He shows that the battle was a learning process for both Armies. 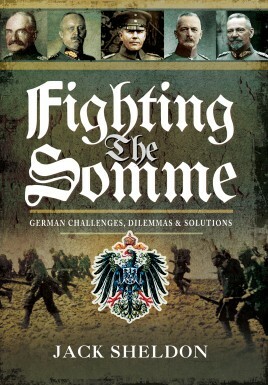 The author ends the book with an insightful look at the battle as a whole, and its repercussions for both the German and Allied Armies.